Happy Mother’s Day! I am very excited to be participating in Sara Levin’s Stamping Sunday Blog Hop this month, especially when you see the line up of participants! 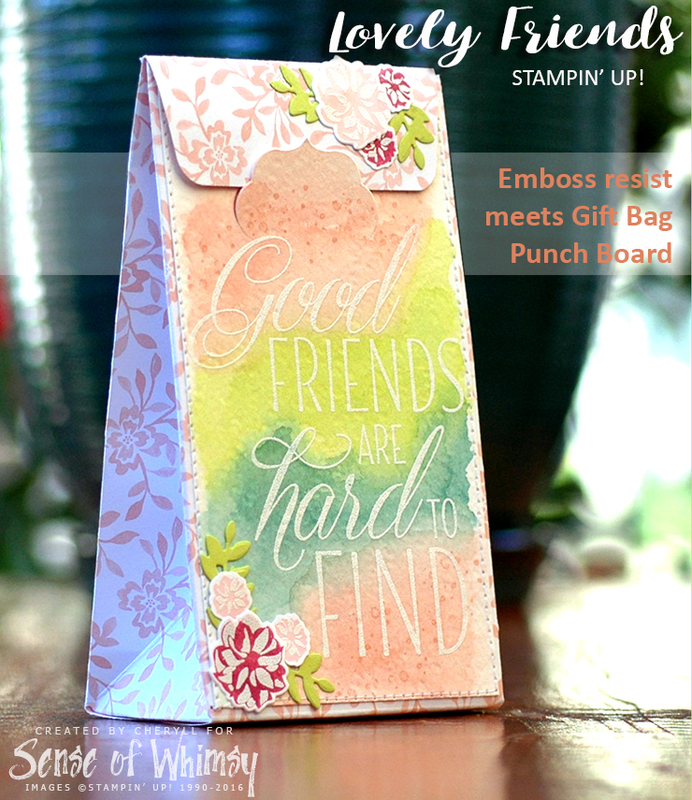 We are featuring new product coming out in the upcoming 2017-2018 Stampin’ Up!® Annual Catalogue … Lovely Friends Bundle. 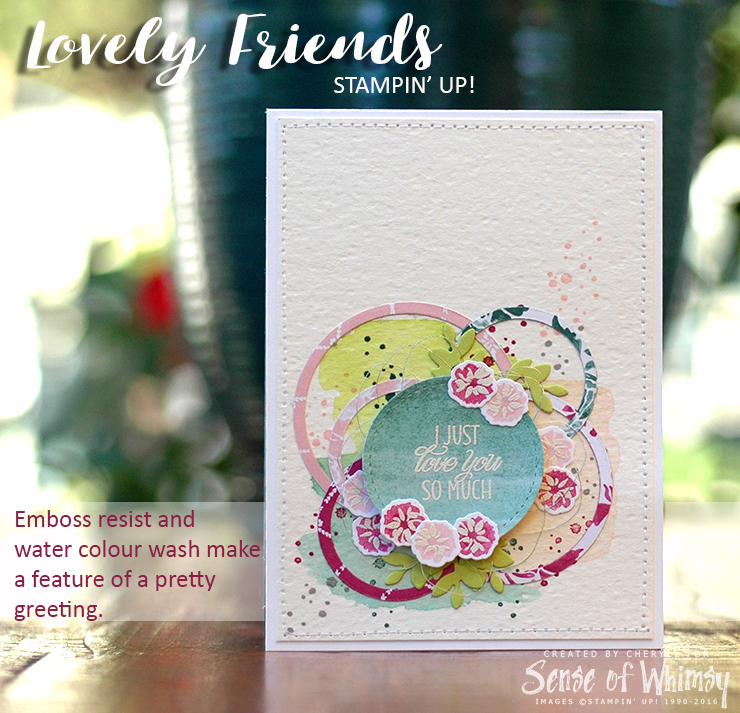 The bundle consists of the Lovely Friends photopolymer stamp set and the Lovely Laurel thinlits dies. 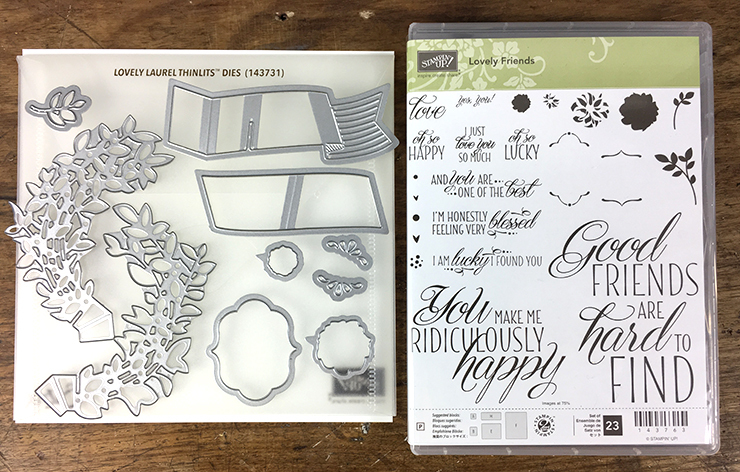 I love the range of greetings in the Lovely Friends stamp set … some are HUGE, some are small and I find the mix of fonts in each greeting very appealing. I have created two projects showcasing the different sized greetings, with a little surprise in each. For this card, I used one of the smaller greetings, white embossed and die cut with a circle from the Stitched Shapes framelits as the feature. And you might be thinking “what colour is that on the embossed circle?” … it is Tranquil Tide, one of the new 2017-2019 In Colours. Normally it is a beautiful deep sea green, but if you watercolour with it, the colour washes back to a delightful minty green shade. I combined Tranquil tide with another two In Colour inks, Powder Pink and Lemon Lime Twist, to create a watercolour washed background on Watercolour paper. The little splashes of texture are from the Timeless Textures stamp set (Wood Mount or Clear Mount). I wanted to use some of the Fresh Florals Designer Series Paper, which features gorgeous florals in the new In Colours, but didn’t want to cover over the watercolour wash, so I created “rings” with the Layering Circles Framelits. 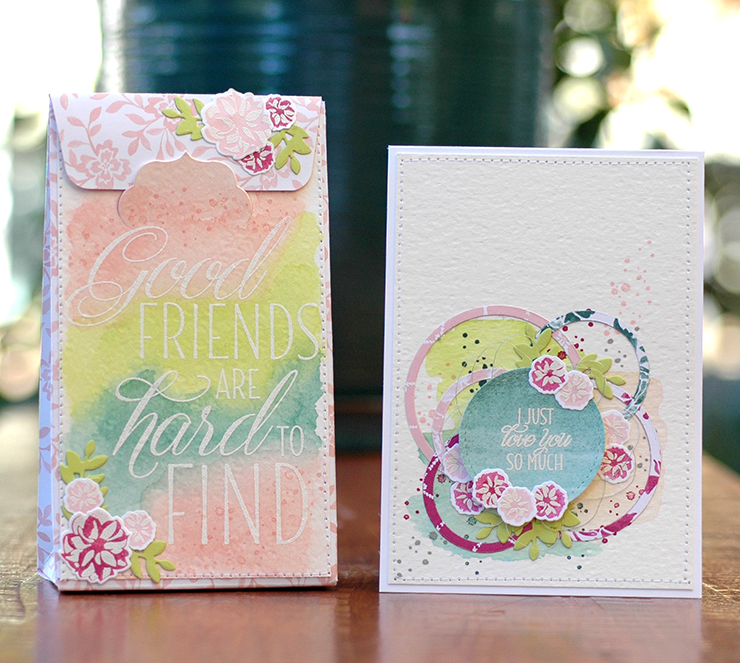 The flowers are from Lovely Friends stamp set, and are a “two step” process. I have stamped the shadow background in Powder Pink and Berry Burst (stamped off), with the second step texture white embossed over the top. And of course, there is a co-ordinating die in Lovely Laurel thinlits to cut out the flowers. Some Lemon Lime Twist leaves add the necessary greenery and a messy swirl of Silver Metallic Thread finishes off the whole chaotic, but “oh so sweet” vibe. 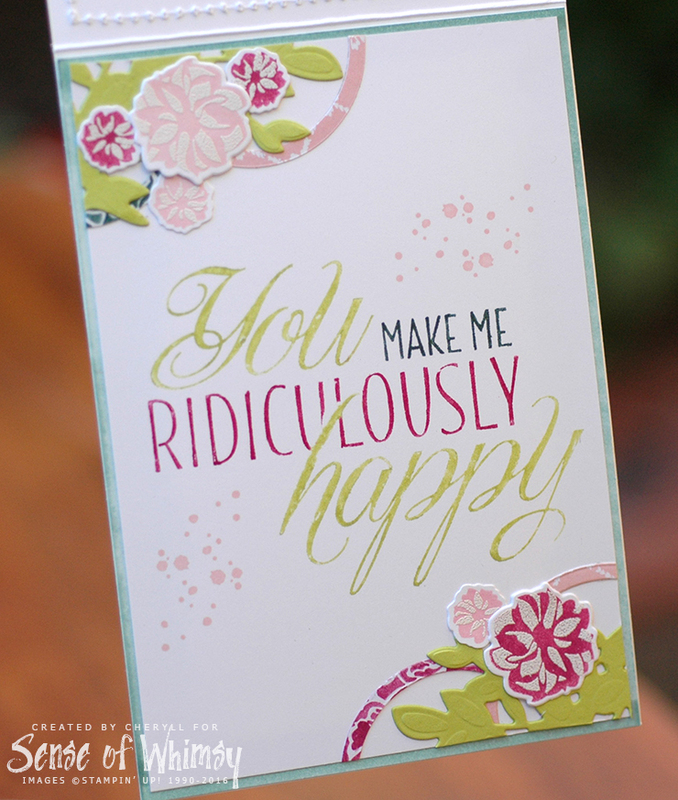 And with such a soft sweet card, you would anticipate a similar feel to the inside of the card, yes? 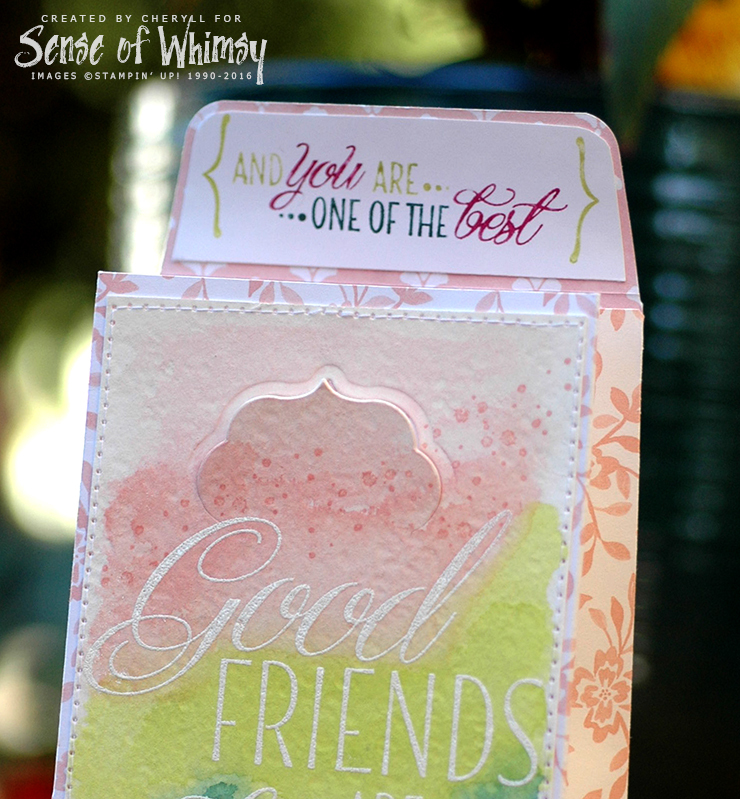 The Lovely Friends stamp set has two large greetings which are a card front in themselves! I have used one of them inside the card for a total contrast, with each word individually coloured with Stampin’ Write Markers (Lemon Lime Twist, Tranquil Tide, Berry Burst). Elements from the front of the card are carried over onto the inside, just a little more “in your face”. Note the larger flowers (also from the Lovely Friends stamp set) and the spray of leaves, which are parts of the Laurel elements from the Lovely Laurel thinlits. And my favourite bit? The minty background layer … created with Tranquil Tide ink, water washed around the edges of a Whisper White panel. I am not anywhere near as sad about Mint Macaron retiring at the end of May now! My second project features the largest greeting in the Lovely Friends stamp set. Using the same 2017-2019 In Colour inks (Powder Pink, Lemon Lime Twist and Tranquil Tide), I have water washed a panel large enough to accommodate the white embossed greeting. Luckily, this is just the right size to fit on the front of a large size gift bag created with the Gift Bag Punch Board and a sheet of Powder Pink Fresh Floral Designer Series Paper. This gift bag has a little flap as a closure and to keep the flap secured, I have used the banner shape from the Lovely Laurel thinlits dies and partially cut it at the top of the watercolour panel (do this before adhering the panel to the bag front … only run the die half way through the rollers on the big shot). And the surprise element to this project? When the gift bag is opened, the smaller greeting “and you are one of the best” is revealed, again with selected words coloured with co-ordinating In Colour Stampin’ Write Markers. The little brackets come in the Lovely Friends stamp set too. So I am all surprised out for a Sunday! I hope you like these two projects. 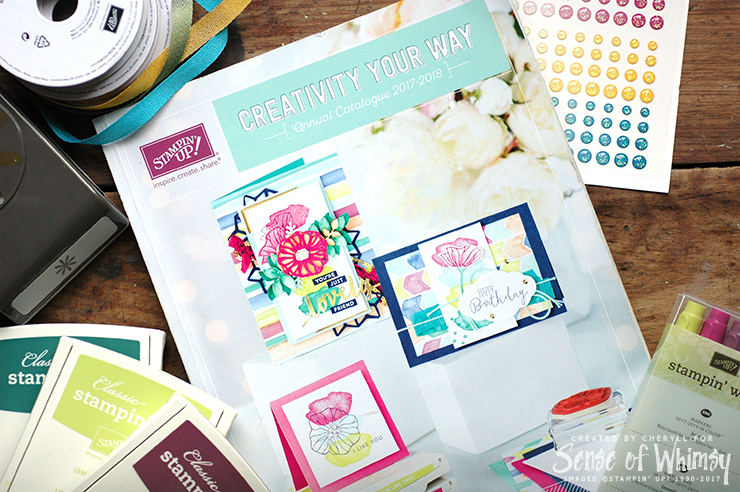 For more fantastic ideas using the Lovely Friends Bundle, hop around to all the blogs listed below. I love looking at your projects, Cheryll. Eye candy, every time! Well done on all the above projects, I much admire your craftsmanship. It looks like you actually stitched on the card and bag. How did you do it? Yes I did Carolyn … While the bag was still flat and not adhered together, I stitched the finished watercoloured piece onto the panel that would be the card front (with sewing machine). I partial die cut the label die into the watercoloured piece before I sewed into place. The watercolour paper is so thick it is perfect to create a sturdy tab to slip the top flap into without it folding back. these projects are so awesome!!!! they certainly match the name of your blog – a sense of whimsy! 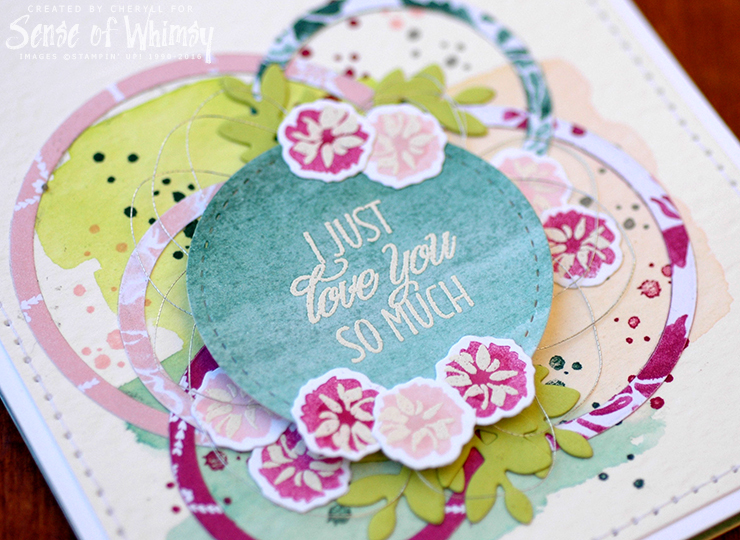 love the watercolour, love the emboss-resist – love them both!!!! Beautiful projects! I love the circle outline shapes, so fun! The watercoloring is so pretty, too! Both have great colors and great surprise insides! Just Wow! These are gorgeous Cheryl. I love your different take on this bundle. I absolutely love your projects. Cheryl, that first card of yours is my absolute favorite card that I’ve seen this year! Wow! It is just perfect! Thanks so much for sharing it with us! Oh my goodness! These projects are absolutely stunning Cheryl. Oh wow, these projects are stunning!!! Wow, absolutely gorgeous! Love the card and how the gift bag has a surprise message when you open it! Lovely, lovely, lovely! STUNNING!!!!! i LOVE the closure on the bag-so clever! Amazing job Cheryll! Yes. Why did it come up anonymous? Weird. Oh so gorgeous Cheryll! Both creations are outstanding. And I really love the added detail of using the tag die as the closure for your bag — great detail.